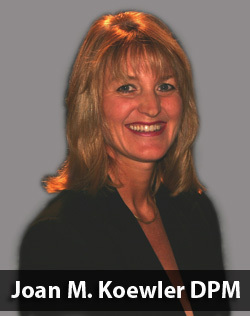 Joan M. Koewler, DPM is originally from Evansville, Indiana and graduated from Indiana State with a B.S. in Biology and Chemistry. She attended Podiatry School in Chicago, Illinois and did her Podiatric Residency at Wellborn Baptist Hospital in Evansville, Indiana. Dr. Koewler has been practicing in the Sarasota area since 1985. She excels in variety of areas and can treat people of all ages. Her mission is to provide whatever treatment is necessary to keep her patients active throughout their lives. Her interests and hobbies include biking, hiking, and scuba diving with her husband, son and daughter. She also enjoys playing and listening to music and supports the arts in Sarasota and Venice.